Q. You spent five years in Paris. In what ways did your time there inspire you to write this book? 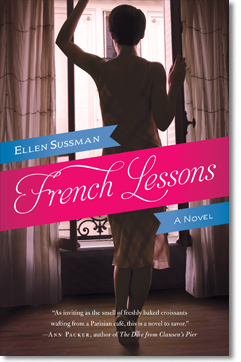 Ellen Sussman: It’s amazing that it took me so long to write about Paris! I must have needed real time for my mind to absorb the images and experiences of that period in my life to turn this material into fiction. When I finally sat down to write French Lessons, many years after living there, I felt transported back to that beloved city. My time in Paris informs each page of the novel – in the observations, in the characters, in the smell, sounds and sights of daily life. Oddly, the Riley section was the last section that I wrote in the novel. (I changed the order later.) I never thought to myself: I’m going to write about my experience of being an ex-pat in Paris with two babies and a husband who worked too much. In fact Riley’s experience is very different from mine. I loved Paris from the start – she hated it. I learned to speak French fairly quickly (though I still have the vocabulary of a four year old!) and I never met a guy like Philippe! (Lucky thing.) But I did learn so much about myself by living abroad – I think it was one of the most transformative experiences of my life. And so, when I decided to take three Americans and put them in Paris on a hot summer day, I knew that their lives could be shaken in very real ways. Q. Speaking both as a creative writing teacher and as a writer, what impact does your teaching have on your writing, and vice versa? ES: I’m very fortunate to have found teaching as a secondary career. It suits my personality – I’m not a very solitary person and writing puts you alone in a room for hours on end. I now teach adults through private classes and through Stanford Continuing Studies – I love having a room full of writers with whom I can share my favorite subject! One night a week, twelve students come to my house for a fiction writing workshop – we drink wine, read each other’s stories and talk about craft. What could be better?! And my students inspire me. They challenge me, they make me think harder about technique and style, they teach me a few new tricks along the way. I might have a particularly bad writing day – struggling with voice, say, in my own novel. I’ll create exercises to explore voice that night in workshop, and the next day I come back to my writing with new understanding. I teach myself by teaching them! So the two careers feed each other in many ways. I love my students. I can’t imagine writing without teaching. Q. Your first book was a novel. Since then, you’ve edited two anthologies and written numerous essays and stories. To you, what are the particular pleasures of the novel, and how does it feel to come back to the form? ES: Fiction is my true love. I cheated on fiction for a few years, but now I’m back in its arms again. I love to make things up. I’m a storyteller, and as my husband will confirm, I rarely tell a story without a few embellishments. Fiction allows me to embellish all I want! I love the first draft of a novel and, as I explore the world I’m inventing, anything is possible. It’s great fun to create characters and watch them take over – it’s always a joyous moment when they start telling me what they want to do next. My intention, in the end, is to take my reader on an emotional journey with my characters. I was drawn to the personal essay form because it’s such an intimate way to reach a reader. My first essay was published in Newsweek and I received hundreds of emails the day after the magazine hit the stands. Readers told me their own stories because they were touched by my story. This connection intrigued me and so for a few years, I focused on the mini-memoir. I learned a great deal from those essays, but I have much more fun writing fiction. It’s a more creative venture for me. Q. What are some of your favorite books? ES: I always read contemporary fiction and try to keep up with the best novels that appear each year. This year, Jennifer Egan’s A Visit from the Goon Squad knocked me out. Last year, I fell for Room by Emma Donaghue. Before that, Let the Great World Spin by Colum McCann was at the top of my list. There are so many fabulous writers out there today. ES: I am finishing a third draft of a novel set in Bali. It tells the story of a young American woman who returns to Bali five years after she was injured in the terrorist attacks there, and she searches for the man who saved her. I had to go to Bali for a month for research (tough gig!) and I just love that gorgeous, fascinating country. Which of the three storylines resonated with you the most? Why? Would you rather have Nico, Philippe or Chantal as your French tutor? Why? Josie finds it difficult to reveal anything about her illicit relationship. Why does Josie keep lying – even to Nico, whom she will know for less than a day? What allows her to finally open up to him? Riley realizes that she doesn’t love her husband anymore, and she’s definitely not in love with Philippe. However, she does love her mother, and “knows what she has to do. Love doesn’t just sit around watching. Love jumps on a plane and shows up” (p 149). In what ways have the people you love shown up for you? Have you shown up for the people you love? Does Jeremy consider himself and his wife to be a happy couple? How does his unconsummated attraction to Chantal change his feelings for his wife? Nico’s poetry collection deals with the idea of multiple truths, multiple versions of the same events. How else is this idea developed in the novel? What do each of the students discover about themselves during their encounters with their tutors? What do the tutors discover? How are they each transformed? Paris feels like a character in the novel. How do Josie, Riley, and Jeremy’s experiences of Paris differ? What does Paris end up meaning to each of them? What do you think is it about Paris that makes people fall in love (or in lust)?